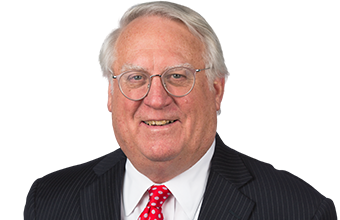 For more than 45 years, Drew Neville has distinguished himself as one of the nation’s go-to trial lawyers, representing clients in numerous high-stakes, high-profile cases across the country. Since entering private practice full-time in 1976, Drew has tried in excess of 200 cases at the trial and appellate levels — more than 150 of which have resulted in a verdict — and has developed a reputation for being a meticulous advocate for clients in high-stakes litigation, including bet-the-company and white collar criminal cases, as well as complex litigation involving business, securities, banking, antitrust, and directors’ and officers’ liability claims. Over the course of his distinguished career, his clients have included prominent corporate executives, media celebrities, sovereign Indian nations, and some of the nation’s leading corporations. In addition to his private practice, Drew has served as a guest lecturer on trial advocacy at Harvard Law School and as an adjunct professor teaching trial practice skills at Oklahoma City University School of Law. Drew’s skills as a preeminent trial lawyer have earned him fellowship in the American College of Trial Lawyers and perennial inclusion in Chambers USA Guide to America’s Leading Lawyers for Business, The Best Lawyers in America (antitrust litigation; bet-the-company litigation; commercial litigation; securities litigation; white collar criminal defense), Benchmark Litigation, and Oklahoma Super Lawyers, which has named him to its prestigious list of “Top 10 Oklahoma Lawyers” every year since its inaugural publication and ranked him #1 for eight years. Early in his career, Drew worked as a legislative assistant to U.S. Senator Henry Bellmon during the time of the Watergate hearings. Upon returning to Oklahoma in 1974, he served as an Assistant U.S. Attorney for the Western District of Oklahoma, where he prosecuted both civil and criminal cases, including those involving fraud against the government, mail and wire fraud, bank fraud, drug and narcotics violations, and interstate theft of stolen property. Prior to joining McAfee & Taft, Drew was a senior partner with the law firm of Hartzog, Conger, Cason & Neville. Drew is also the author of the nonfiction book Jack’s 45th, which chronicles the life of his father, Jack Neville, while serving in World War II as a soldier in Oklahoma’s 45th Infantry Division. Represented Hilton Hotels Corporation and the Las Vegas Hilton in the defense of claims alleging negligence related to hotel security provided at the 1991 Tailhook Association Air and Naval Symposium held in Las Vegas, Nevada. Represented an FBI special agent in his suit against G.Q. magazine for libel and slander related to his investigative efforts of the death of an inmate at the Federal Transfer Center in Oklahoma City, Oklahoma. Defended Canadian Imperial Bank in class action securities cases and other related cases filed in the U.S. District Court for the Southern District of Texas as a result of the Toronto-based financial institution’s lending activities and the failure of Enron Corp. Represented the general counsel of the nation’s largest purchaser of credit card debt in defense of claims related to an alleged federal securities violation involving the sale of $1.6 billion in securities, notes and securitizations. Represented a corporate executive charged in the U.S. District Court for the Southern District of Florida with violations of the Racketeer Influence and Corrupt Organizations (RICO) Act and wire and mail fraud statutes related to the “gray market” diversion of pharmaceuticals. Represented an attorney in a 54-count indictment returned in the U.S. District Court for the Southern District of Texas alleging various conspiracy, wire fraud and money laundering allegations involving alien insurors’ reinsurance of U.S.-domiciled ERISA qualified employer self-funded insurance programs. Obtained dismissal of the indictment. Represented an attorney-banker and owner of five FDIC-insured banks in western Oklahoman in the defense of a 30-count indictment alleging wire and mail fraud, conspiracy, and false statements related to a scheme involving 21 alleged “insider loan” transactions. Represented the president and chairman of the board of a telecommunications company in a class action suit in the U.S. District of Court for the Western District of Oklahoma alleging violations of various federal and state securities laws. Represented the Oklahoma Health Care Authority in a class action brought by all nursing homes within the State of Oklahoma involving the computation of Medicare and Medicaid reimbursement rates. Represented a multi-state furniture retailer in an anti-trust action involving alleged violations of the Robinson-Patman Act and other unfair trade practice laws. Represented the Choctaw Indian Nation and Chickasaw Indian Nation against the State of Oklahoma in connection with tribal sovereignty and venue issues related to torts occurring on tribal property, hotels and casinos owned and operated by the Nations. Represented Imelda Marcos as personal representative of the estate of her husband, the former president of the Philippines, in a class action case brought in the U.S. District Court for the Southern District of California involving alleged violation of the civil rights of Philippine citizens. Represented an Oklahoma decedent’s estate in multi-district litigation involving the crash of Delta Airlines Flight 191 at Dallas-Fort Worth Airport in August 1985. Represented a national accounting firm in multi-district litigation alleging violation of federal securities laws, RICO, and fraud related to the sale of interests in oil and gas limited partnerships sponsored by a petroleum company. Marshaling the Evidence: Drew Neville does his homework. And then he does it again.